When it comes to gambling on my Android, I have a few things that I look for. First off, the casino has to have a good reputation for not screwing players over in terms of banking and bonuses. 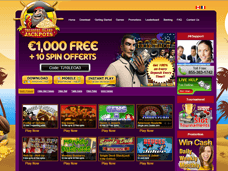 Secondly, I am looking for an Android casino that is responsive and easy to navigate. Thirdly, the casino has to have fun games for me to play on my phone or tablet. Many casinos fail to meet this mark, and are pretty disappointing. When I was given the assignment to review Treasure Island Jackpots Casino on my Android smartphone, I did not know if it would be a diamond in the rough or a pit of mediocrity. How did Treasure Island Jackpots Casino fare? Read on to find out. 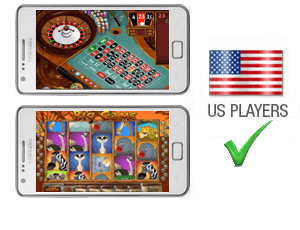 When I began my review, I navigated to Treasure Island Jackpots’ website on my HTC Droid DNA and was struck by the bright colors and large buttons presented on my device. The theme is definitely pirate themed, with a bright sunrise and a fearsome Blackbeard-esque looking pirate on the main screen. Because I had never heard of Treasure Island Jackpots Casino before, I had to register an account on my Android. The process really was quite painless, as I was able to enter in much of the information using my Chrome browser’s stored information. The registration process was maybe a minute or so in length, which is a lot better than a lot of other Android compatible casinos out there. When it came to putting money into Treasure Island Jackpots Casino, my Android device offered me a single option to deposit with. This is not really the fault of the casino, though. I am an American gambler and am always plagued with limited banking options (thanks US government!). The way I did manage to get my deposit credited was to use my Visa card through my Android phone. Punters in other areas can use Skrill, Ukash, UseMyWallet, PaySafeCard, EcoCard, and Bank Wire. Even with the limited options, I was happy to see that the deposit I made was instantly accepted and credited to my account. There have been other Android casinos that have delayed deposits for some reason, and it always puts a sour taste in my mouth. Thus, I was very happy to see my money exactly where it should be. Bonuses are a bit of a let down for me, as I am used to cashing in on first deposit bonuses that are 100% and up. When I got to the bonus screen on my Android, I was struck by the odd-looking 90% match bonus that was offered. While the 90% match number isn’t a horrible bonus, there are other casinos that offer reliable betting on my Android smartphone. I would just assume stick with the site that gives out more free money. Treasure Island Jackpots Casino is not that casino. The Games: Fun, But Where Are The Table Standards? One of the brightest spots at Treasure Island Jackpots Casino on my Android were the games. BetOnSoft, a betting designer that is growing a nice reputation for putting out fun slot and table games, powers the casino, and the results are fantastic. The slots are a lot of fun to play, and feature many completely animated symbols and games. I really got a kick out of playing titles like Fistful of Dollars with its Western theme, and the hilarious Monkey Business slot. All in all, there are more than 25 different slots on the Treasure Island Jackpots Casino Android roster, which is a pretty healthy amount for a mobile casino. More titles will definitely be added as the platform expands. Video poker is also offered at Treasure Island Jackpots Casino, and while it isn’t as flashy as the slots, it is a solid playable video poker offering that you should take a look at if you are a video poker fan. There are eleven titles on offer here, and they contain everything from Deuces Wild to Jacks or Better. The big disappointment here is the same issue that I have with every other BetOnSoft Casino that I have come across: there are no table games! You heard that right; there are no table games in the Android library at Treasure Island Jackpots Casino. This is a big shame, as there is no blackjack, baccarat, roulette, poker, or craps to be heard or seen. I love playing these games for real money on my smartphone, and it is a real bummer that they are not here. With that being said, the Android casino at Treasure Island Jackpots is very nice, and I really like what they put out here in terms of slots and video poker. I just need to see the table games before I make this casino a must play. The process of playing the casino was great for about a day or so, but eventually I lost all of my money and was not able to complete a withdrawal. Still, I wanted to be able to write about the various methods available for withdrawal and have included them below. The options available at Treasure Island Jackpots made available on my Android phone were a bit murky at best, so I ended up hitting the PC casino and inquired as to the ways the casino allows withdrawals. The support staff was quick to pick up on the live chat and the agent I had (Mark) was not very helpful. I ended up waiting several minutes to get a simple 13-word answer, which did not include any helpful information. If other BetOnSoft powered casinos are used as an example, then you should be able to get your money via Check, Bank Wire, or Credit Card Refund. I can’t vouch for this here, as the support staff and web pages were of absolutely no help, and I couldn’t find the information. Overall, Treasure Island Jackpots is a decent casino that is undone by a few big components. I am able to say that the games are fun but lack standard table games, which is a bit of a bummer but not really Treasure Island Jackpots’ fault. The bigger grievances I have are with the bonus system and the support, which are both underwhelming. You can find a similar casino that will give you a better deal and offer better service than Treasure Island Jackpots Casino. The lack of information on withdrawals is concerning, and the staff is apparently clueless to their casino’s own policies.